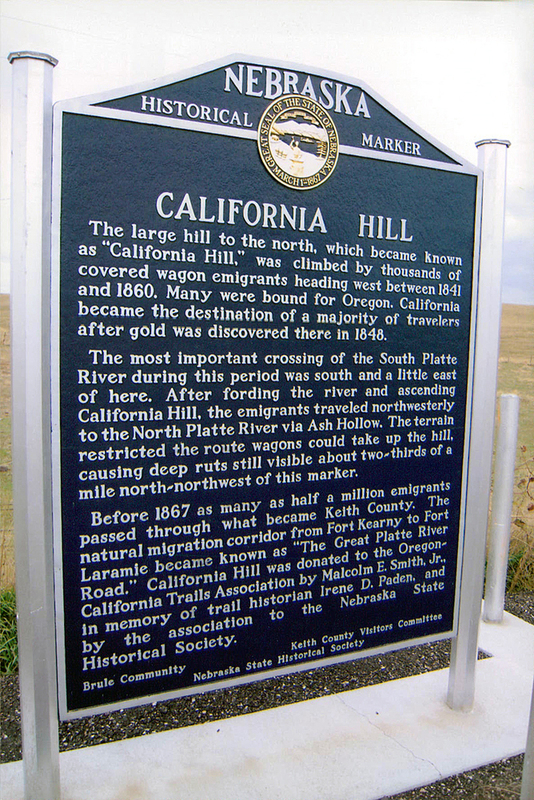 This hill, which became known as "California Hill," was climbed by thousands of emigrants heading west during the covered wagon migration, 1841-60. Many were bound for Oregon. California became the destination of a majority of overland travelers after gold was discovered there in 1848. The most important crossing of the South Platte River during this period was south and a little east of here. After fording the river and ascending California Hill, the emigrants traveled northwesterly to reach the North Platte River by way of Ash Hollow. The terrain restricted the route wagons could take up the hill, causing deep ruts that are still clearly visible. This site and marker were gifts to the Oregon-California Trails Association by Malcolm E. Smith, Jr., in memory of Irene D. Paden, who dedicated much of her life to retracing and writing about the Oregon and California Trails. Assistance in acquiring the site was provided through the generous cooperation of Ivor D. and Carol A. Dilky, the Farmers Home Administration, and the Adams Bank and Trust. “California Hill,” Explore Nebraska History, accessed April 19, 2019, https://mynehistory.com/items/show/308.